Create the perfect ham and cheese sandwich following these easy instructions. They will take you only 20 minutes, so it's perfect for a busy evening. Heat oil in medium nonstick skillet on medium heat. Add onions; cook and stir 5 min. or until crisp-tender. 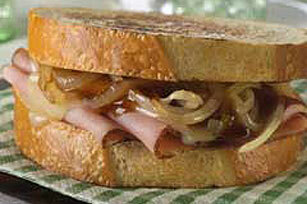 Top 1 bread slice with ham, cheese, onions and barbecue sauce. Cover with remaining bread slice. Add to skillet; cook 3 min. on each side or until cheese is melted and sandwich is golden brown on both sides. Spread outside of sandwich with 1 Tbsp. MIRACLE WHIP Dressing before grilling as directed.